For an unpotted character the monsters that you encounter on the way to the boss room can be trouble. The best way to handle these guys is to do large circles in a room while shooting them as they chase you. The Snake Pit has a chance to have one or more Treasure Rooms (known as Troom). The picture shows 2 treasure rooms. A treasure room is always entered on the left or right passage from a room not from the top or bottom. 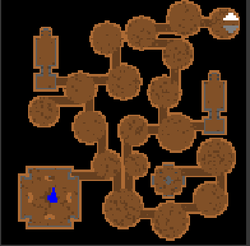 The Treasure room is the same height as the boss room so you automatically know that if you are close to the top of the map there can be no treasure rooms making it even easier to know where the Trooms aren't. A treasure room boss is activated at the top by standing on a button. The Troom boss is fairly easy but if you are not potted be careful of the arrows shooting across the room. The boss will drop the same items as the main boss Stheno. The Snake Pit is pretty easy but you can be overwhelmed by the large snakes so be careful. Clearing as you go will be safer than rushing to the boss. The boss is always a challenge for an unpotted character because the large flying snakes. These snakes shoot bullets that "Slow" and hit hard. When the boss unleashes the small snakes their damage can add up quickly. You can find some safety in the corners behind the unbreakable pillars while you heal up. The Snake Pit is really easy, you now can rush to the boss Stheno making sure that you don't double back into a pile of large snakes. Once at the boss, just watch the "Slow" and make sure you keep an eye on your health. It is still possible to get slowed and overwhelmed to the point where you have to be concerned with jumping to Nexus.